I am happy to say that the summer fish have well and truly arrived. With the return of the Mackerel, a lot of other species have turned up in numbers as well. I heard reports of a 15lb Thornback Ray being landed to the West of Bridging Camp. There are so many small Smoothound around that they have become a nuisance. Almost as soon as a crab bait hits the water a 2 or 3lb pup leaps on to it. Big Bass continue to make the headlines. 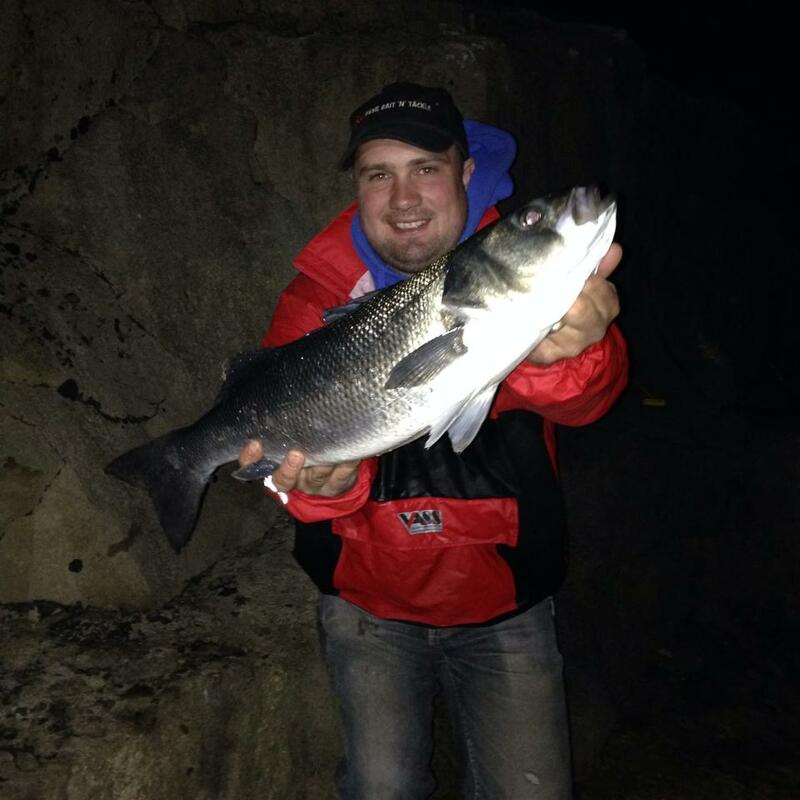 Shaun Nutley caught this 8 1/2lb Bass on Saturday night whilst fishing for Conger. He returned it safely to fight another day. He also reports that he managed a few small Conger and had some large Rockling. It sounds like I might have to get out on the rocks on night soon. The fishing on Saturday was a lot better than yesterday, due to the swell that the SW wind kicked up. It effected the water clarity quite a bit, but it should clear again quickly now that the wind has dropped again. I fished on Saturday with Guy Truelock, who runs True Fishing Gear. We went in search of fish on lures and flies. 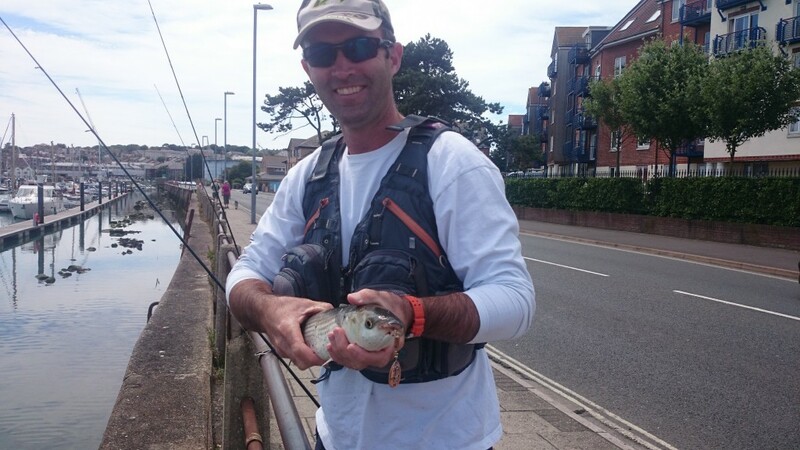 To be honest conditions were far from ideal, but Guy did manage to catch a nice Thin Lipped Mullet on a Mepp, from Weymouth harbour. It is well worth checking back every day this week, as unlike last week, we have a lot of new stories for you. Chesil Beach forecast: Conditions towards the later part of the week look perfect for most species except Bass. Calm and clear water will be ideal for Bream, which there seems to be plenty of now, some of them exceeding 3lb. Plaice will also enjoy the calm conditions and smaller tides. However you will need to fish at distance. I am hoping that the size of the Smoothound will get bigger as the smaller ones move along. Mackerel should be plentiful now. Portland: As soon as the water clears completely the Pollock fishing will come alive again. Wrasse continue to feed well in these conditions. You can expect to catch them on lure and bait. As mentioned earlier, there are a good number of decent sized Rockling, and we should see some decent sized Conger after dark, especially on the smaller tides. Portland Harbour: Lots of baitfish in the harbour, which brings in the Bass, Mackerel and Garfish. I have heard of numerous Gilthead Bream being caught along the coast, so with some luck we may see some in the harbour. Weymouth Bay: Weymouth piers fished very well recently, and I can see no reason why that wont continue. However due to the school holidays they will be busy. 7 Responses to "Summer beach fishing"
Thinking about driving down from Newbury to catch a few mackerel. Please could you advise if you think it will be any good or not as there seems to be conflicting reports, some saying the mackerel are hard get and others saying they are in abundance. please could you also Advise on abbotsbury or Portland. Any advice would be much appreciated. Go by what the latest report says. I fish almost everyday, so I know what is happening on a day to day basis. I get a bit annoyed with idiots on forums and facebook pages spouting rubbish about what they think might be happening, and haven’t been near the water for weeks. The fish are all along the beach at the moment. However as is typical with Mackerel they travel up and down, so you might not see them for an hour or so, then they turn up and they stay around for hours. If it is calm, the Smoothounds prefer the shallow water at Abbotsbury and West Bexington. However if it is anything less than calm then Ferrybridge end fishes better. hi will be popping down next week some time for mackerel was wondering if you could tell me a good spot to try? Anywhere on Chesil. The shoals will come and go throughout the day and evening.